Scientists have found a way that high-sugar diets may influence our risk of developing cancer. People who regularly eat large amounts of sugar may face an increased risk of cancer, scientists have found. Figures show that people with diabetes - a disease where the body fails to control blood sugar levels - are more likely to develop pancreatic and bowel cancer than those without diabetes. Now, scientists at the University Rey Juan Carlos in Madrid have discovered a mechanism that links diabetes and obesity with cancer. The research team found that high sugar levels boost the activity of a gene involved in the progression of cancer. Laboratory studies revealed that sugar levels influence the activity of a protein called beta-catenin, which in turn controls the ability of intestinal cells to secrete a hormone required for the release of insulin by the pancreas. Increased activity of beta-catenin is already known to play a role in the development of many cancers, so the discovery that high sugar levels lead to the accumulation of beta-catenin and the proliferation of cells could help to explain the link between obesity and diabetes and cancer. Dr Custodia Garcia-Jimenez, whose findings are published in the journal Molecular Cell, admitted the team were "surprised" to find that metabolic changes as a result of dietary sugar may influence people's risk of cancer. "We are now investigating what other dietary components may influence our cancer risk," she revealed, adding: "Changing diet is one of easiest prevention strategies that can potentially save a lot of suffering and money." Colin Goding, professor of oncology at the University of Oxford, confirmed that the study provides a key mechanism by which high blood sugar may predispose a person to cancer. The latest study is just one in a growing body of evidence for links between diet and cancer risk, many previous studies showing the importance of a healthy, balanced diet with plenty of fruit and vegetables. 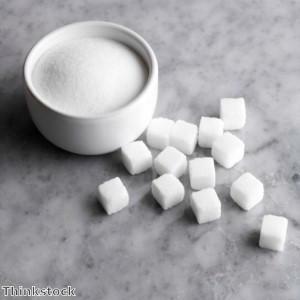 People who want to reduce their sugar intake may wish to try an alternative such as xylitol, a low-glycemic sweetener that occurs naturally in plants such as berries, vegetables and mushrooms. The Really Healthy Company's xylitol product, AlphaSweet, is made from sustainable birch trees and is almost impossible to tell apart from regular sugar, both in terms of its appearance and its taste. AlphaSweet can be used in place of sugar and is ideal for those trying to lose weight, as it contains fewer calories. Research also suggests that it may help to prevent and even reverse tooth decay - good news for those with a sweet tooth.